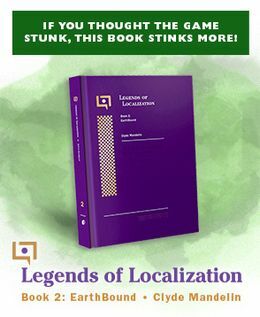 Many EB Central regulars know that I relatively recently started a new site called Legends of Localization in which I dig deeply into the localization and translation differences between various video games. 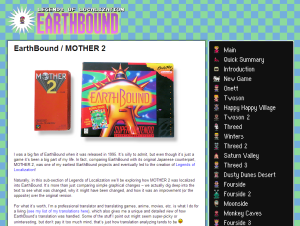 For years I’ve had my EarthBound/MOTHER 2 comparison here on EarthBound Central, but now it makes more sense for me to put it over on LoL (don’t laugh!). It took a while, but now the stuff has been moved over! Check it out here! Rather than just move everything over as-is, I also gave the EarthBound/MOTHER 2 comparison a better layout and made it consistent with the other games I’ve compared. While I was at it, I fixed some small details and added a tiny bit of new content – not much, but just a few things. For instance, I point out that Starmen are apparently hired killers/assassins, which is something I didn’t mention before. In fact, the whole first half of my EarthBound analysis is pretty thin – just compare one early page with any of the other games I’ve compared. So I’d love to go and add lots more content someday, but I think I might save all that as extra stuff for a book version. Anyway, now that I’ve got the new site up and everything moved over, I can hopefully get on with my Final Fantasy IV and MOTHER 3 stuff! You’ve just shaped the new face of MOTHER fanworks for years to come with a single sentence. Like I’ve said many times before, my favorite game in the series is the first, so I’d personally love to see that first. And this is coming from someone who LOVES reading your analysis on Mother 3… I’ve waited this long, I can wait a little longer if it means you’ll discuss Mother/EB0. Hey Mato, since stuff has settled down a bit. When are you releasing the Mother 3 patch? Since the Mother 3 notes have sort of helped me dig deep into the translation again, I’ve found a lot of little things that I’d like to improve. So I’d prefer to wait until after the Mother 3 notes (which at this rate should be in 2049) to release an updated patch. Jeff and I will probably still release the source code, files, and stuff at some point much sooner though. That’s something that I really want to do so people can translate the game into other languages without needing to rely on us. Just wanted to let you know that we greatly appreciate your taking the time to do this – and should you release any books on EB/Mother 3 I’d buy two copies. One for me and one for my next of kin. Your LoL site is really great looking. Would it be too much to ask what other changes there are for EB? There aren’t many, the big ones I remember off the top of my head are the Starman one and some talk about Mr. Saturn speech. There were probably 3 or 4 other little additions too. But anyways, I really love this change. It maintains consistency with the other projects. Buster: There’s a version of Visual Boy Advance that runs on the Wii. If you’ve already hacked it to run Homebrew Channel, you should be good to go. I’ll refrain from linking since I can’t recall offhand if Mato appreciates links to emulation sites on his blog, but you can find it simply enough. I wouldn’t mind at all you switching the the Mother 1 comparison.